If you are one of the fortunate horse owners who have a lot of acreage when it comes to pastures, you have probably quite frequently simply opened up the ban door and let your horses out to graze at will wherever the fancy took them. On the other hand, if you only have limited room to work with, you know that doing so will result in a pasture that is soon grazed down to the dirt. Thus it is not surprising that owners of smaller pastures have found it useful to manage their pasture by enforcing rotational grazing. Frequently you might have noticed that a smaller pasture was divided into sections, some of which were grazed down, some of which looked like they were recuperating, and some of which were still untouched. Divided by electric fence tape, the horses are kept in the desired sections, while the previously grazed on section is permitted to re-grow. The rationale behind this policy is simple: the resting forage will be able to channel its energy into growth and root development and you will not have to face brown patches of dirt. In addition to the foregoing, it has been shown that rotational grazing also reduces the occurrence of weeds. Of course, another aspect to proper pasture management is soil maintenance. Obviously, it is not enough to just have healthy soil, but you will need to monitor the soil to make sure that it has sufficient nutrients in it. Soil testing will quickly reveal if your dirt has the essential nutrients that ensure proper plant growth. By ways of a refresher course, what your soil needs to contain to enable any growth are the major nutrients – potassium, phosphorus and nitrogen – as well as the secondary nutrients – sulfur, calcium, and magnesium – and of course the micronutrients – chlorine, boron, copper, zing, manganese, iron, and molybdenum. It is interesting to note that nitrogen in pastures that lack legumes is highly limited, and supplementation of as much as 60 pounds per acre per grazing cycle is required, as opposed to pastures with a mix of about 10 percent of legumes which only require about 30 pounds of nitrogen. Your overall pH level should be about 6 to 6.5. If you have acidic soil, ground limestone will help. Another aspect of pasture maintenance actually has to do with the kinds of forage you grow. Ideally, you should sow a mix that contains about 20 percent orchardgrass, 20 percent ryegrass, 10 percent timothy, five percent clover, and 45 percent Kentucky bluegrass. Some horse owners substitute alfalfa for one of these plants. 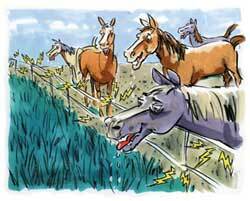 You will be able to do the most maintenance when your horses are not actually grazing the entire pasture but instead are corralled so as to limit their access. In winter this will prevent dormant plants from being eaten up or trampled down, and you will be rewarded with healthy growth in the spring and summer. When corralling the animals in summer, you will be able to allow grasses grazed down to about three inches to rapidly re-grow to six inches, at which point grazing may commence. Read the next horse pasture article on Feeding Horses Round Hay Bales.